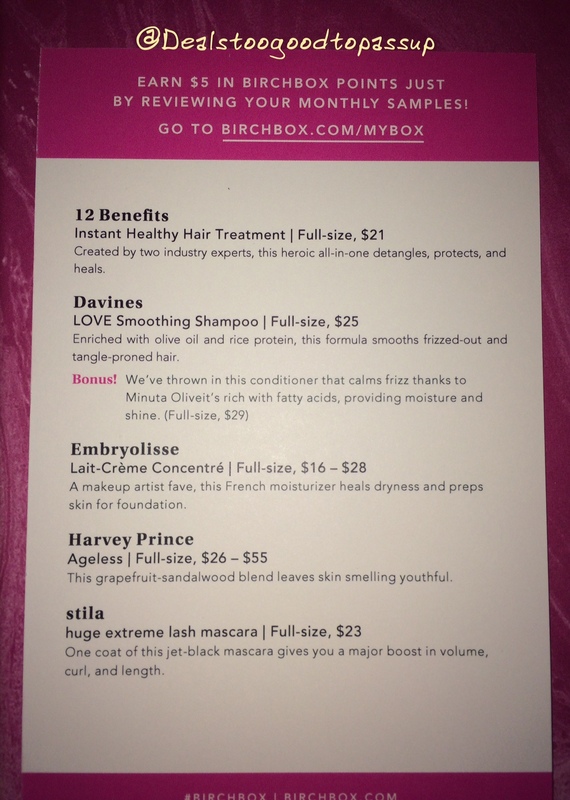 Birchbox gives at least five beauty samples each month for $10. For every review I give, I get 10 points, which is equal to $1 in the shop. A six sample box like this one got me $6 back. I also shared my box on Facebook for an extra 10 points. That gave me a total of $7 back to redeem toward future purchases. You can read my detailed overview of the program for more information. Each month, you get a sample choice or you can select the guest editor box. For this box, I selected the stila mascara. 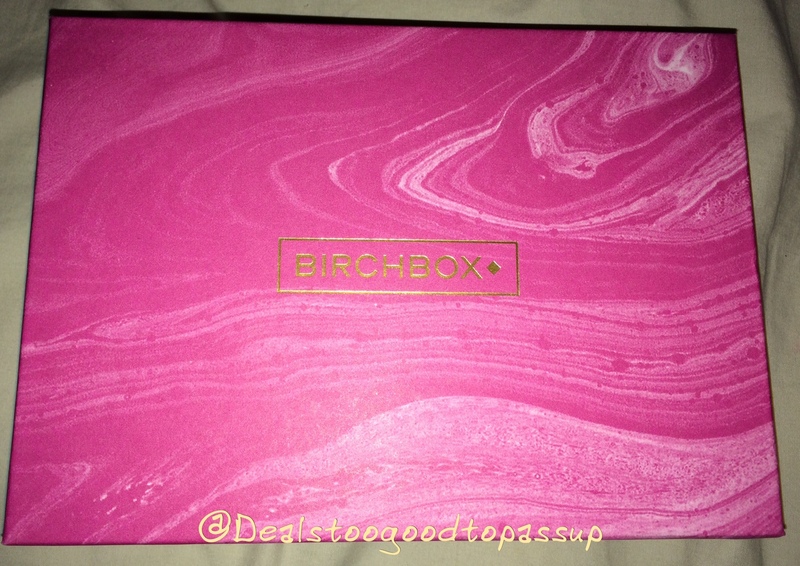 This is the second of my two Birchbox Subscriptions. Box One is different. There were two boxes designed specifically for The Estée Lauder Companies’ Breast Cancer Awareness Campaign. 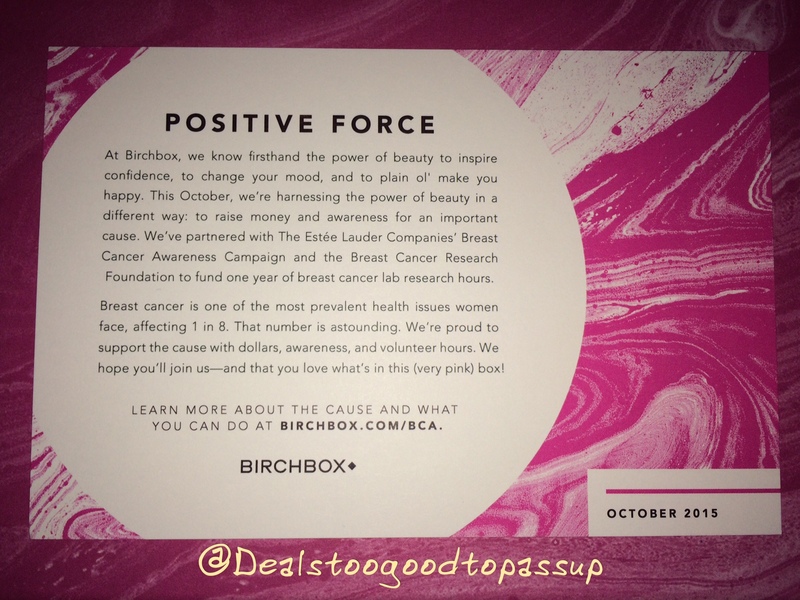 Power Pose box featured the light pink version. Game Face featured the dark pink version. I really love the design of the box and did not care whether mine was light pink or dark pink, so I went with the one featuring the products that appealed more to me. The first thing you notice when you open a box is the product card. It gives you a brief description of the products as well as the cost to purchase the full size. Unless you choose to opt out for some reason, you will always get a sample choice. You can either select one item from a choice of 3-5 items or a featured box where you know all five in advance. Sample choice this month was between five mascaras: Benefit They’re Real, Benefit Roller Lash, Eyeko Black Magic, W3ll People Extraordinary Mascara, or Stila Huge Extreme Lash. There was also an option to select one of the two featured boxes. Power Pose includes: Estée Lauder Advanced Night Repair Eye Serum, Smashbox Photo Finish Foundation Primer, Clinique Chubby Stick™ Moisturizing Lip Colour Balm in Mega Melon, Darphin STIMULSKIN PLUS Multi-Corrective Divine Cream, and Clinique Moisture SurgeTM Extended Thirst Relief. Game Face includes:Estée Lauder Revitalizing Supreme Global Anti-Aging Creme, Smashbox Photo Finish Foundation Primer, Prescriptives False Lash Mascara, ORIGINS Checks And Balances™ Frothy Face Wash, and Clinique Dramatically Different Moisturizing Lotion. Although I was not thrilled with selecting another mascara, I already picked the only featured box that did not include mascara on my main account. That was the only choice that ensured you would not receive mascara. Short of selecting nothing, which would probably garner a mascara anyway, there was no way outside that option to receive a mascara free box. My choice this month is the 0.2oz stila huge™ extreme lash mascara. While I have more mascara than I can ever use, there was only one option to get a box sans mascara, and I selected it on my main account. This is a mascara I have not tried yet, so I may keep it if I decide to try it over any of the other 63 in my current stash. It is worth $10.45. I really like this mascara. It’s the best one I’ve used in a long time. My lashes look longer and more defined. There is no clumping. I never place value on foils, but I love receiving them for the 10 review points. It is nice that the foil is a generous 0.4oz size. At that size, I am sure to get at least one and maybe even two uses. This foil along with the shampoo also came in my third September 2015 box, but I traded them to a Davines lover when I saw I was getting them in my second box. Thus, I am definitely keeping both this time. The 2.5oz Davines Love Smoothing Shampoo is worth $7.40. Davines is very generous with its sample sizes, so I am happy to see they did not skimp here either. Mine sadly spilled a bit, which smells wonderful. There is still a lot of product to sample, so I do not need a replacement. If it smells as good on my hair as it does all over the box, that will be nice. The 0.05oz Harvey Prince Ageless Pink Grapefruit is worth $4.38. I use the smallest size to calculate value, because it is the cheapest buy-in. This has a great fruity scent with a light hint of floral. It was very pleasant and lasted about half the day. On a scale of 1 to 10, I’d rate this a 6.5. The 0.17oz Embryolisse Lait-Crème Concentré (24-Hour Miracle Cream) is worth $1.87. While I never look forward to trying items that are allegedly multi-use, I’ve heard of this. Some people give it great reviews and others hate it, I look forward to seeing which side I agree with. My skin is really dry in some parts, so multi-use products are not usually moisturizing enough. The 1.5oz 12 Benefits™ Instant Healthy Hair Treatment also opened in transit and spilled a little. Luckily, most of it is fine, so I do not need to contact customer service for this either. It is worth $5.25. My only issue is I’ve had three leave-in products open in transit in the past few months. Expiration countdowns are ticking on all three of them (Target Beauty Box, another Birchbox, and this), so I have to use these recent ones sooner than older ones in my stash. The box has a $29.35 value. My personal value is also $29.35, because I will try everything in here. I enjoyed your BB review esp your items!! I love the shampoo/conditioner duo from last month and the rich cream which is perfect on dry skin! Great to read. I was worried it would not be moisturizing enough. We shall see.